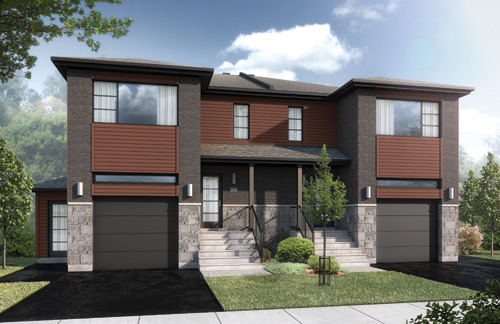 The Rubis 2.5 semi-detached model is a variation of the highly popular contemporary townhome model. Inspired by urban-style living, this new home is designed for young couples and families looking for the perfect balance between stylish design, comfort and price. The modern architecture combined with the perfect marriage of high end exterior finishes creates a captivating curb appeal. Featuring beautiful living areas such as a spacious master bedroom with a breathtaking ensuite bathroom, open concept modern kitchen with cabinets to the ceiling and stylish 2.5 bathrooms, this townhouse model is the consistent top choice for most of our new home buyers looking for a 3 bedroom option. Our semi-detached models have been designed for comfort and peace of mind. Second to none, we employ the most advanced methods of soundproofing between homes. Living in a Rubis series semi-detached model will provide you with quiet enjoyment and peace of mind that you would expect from a well-designed townhouse model.